Factory Mutual approved for US & Canada. Compact, lightweight and extremely affordable while providing excellent explosion protection. Battery opteration*1 (200+ hours) for high portability, requiring no power supply from a safe area via a safety barrier. Auto power OFF function to save battery power. Easy-to-read LCD display with backlight (16 mm character height). Hygienic and chemically resistant stainless steel (SUS304) weighing pan. 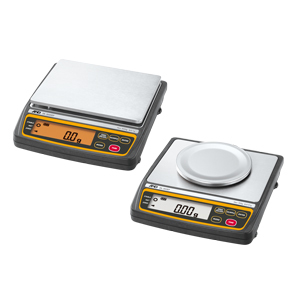 Multiple weighing units: g, oz, lb, ozt, ct, mom, dwt, gr, N, in addition to pieces (counting mode), % (percent mode) and SG (specific gravity). Comparator function for faster and more accurate filling, packing, sorting, and dosing. Adjustable response characteristics depending on the degree of drafts and vibrations at the location. Security ring for locking the balance to prevent theft or removal. *1 Only to be used with four DURACELL AA alkaline MN1500 LR6, ENERGIZER AA E91 alkaline, LR6 AM3, or Panasonic AA alkaline LR6 (XJ) 1.5V batteries.